Furtiveness and secrecy surrounded the building one of the most infamous ships ever to be built on Merseyside - which started life under the anonymous tag, Vessel number 290. The ship with no name was constructed at the Birkenhead yard of John Laird and Son, forerunners of the illustrious Cammell Laird shipbuilders. Commissioned by James Dunwoody Bulloch, the purpose and destination of the ship was shrouded in mystery as far as shipyard workers were concerned. 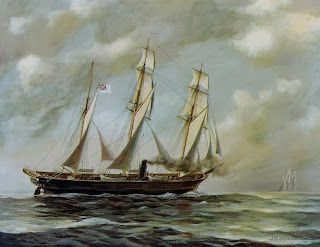 However John Laird, as well as the British Government and, of course, Bulloch, were aware that it was actually being built as a blockade runner for the Confederate faction in the American Civil War; Bulloch, the southern states’ representative in Liverpool, was responsible for buying and building ships during the Civil War and arranged the largest single delivery of arms to the Confederates in October 1861. Vessel 290 was specially designed to achieve success as a raider with the object of attacking merchant ships belonging to the northern states - a mission she was destined to fulfil in spectacular style as the Alabama. Though built in the Laird’s yard, the ship was not equipped with arms on Merseyside, partly in order to allay suspicion and partly to ensure the laws directing British neutrality in the Civil war were not broken. The ship destined to become the most feared and destructive commerce raider in maritime history was launched on 15 May 1862 under the name Enrica. Despite elaborate attempts at concealing the truth behind the ship, the suspicions of Northern agents had already been aroused and the American government had already begun to make inquiries as the 'Enrica’ sailed out of Liverpool. This date was billed as the day for the ship’s final sea trial, and in order to give credence to the story a party of official guests was invited on board. After an enjoyable and apparently innocuous day at sea, all the guests were transferred to a tugboat and returned to Liverpool. Meanwhile the Enrica seized the opportunity to escape and despite interception attempts by the American Navy, she was able to reach the Azores, where she was equipped with arms. On 24 August the Confederate flag was raised and the ship acquired the name Alabama. The Alabama waged a two year campaign of terror during which a staggering 66 ships were either seized or capsized. Such an ominous reputation was acquired by the Alabama and other Confederate raiders that President Abraham Lincoln threatened to hang their crews for piracy if they were captured. Captain Raphael Semmes, Alabama's commanding officer, standing by his ship's 110-pounder rifled gun during her visit to Capetown in August 1863. 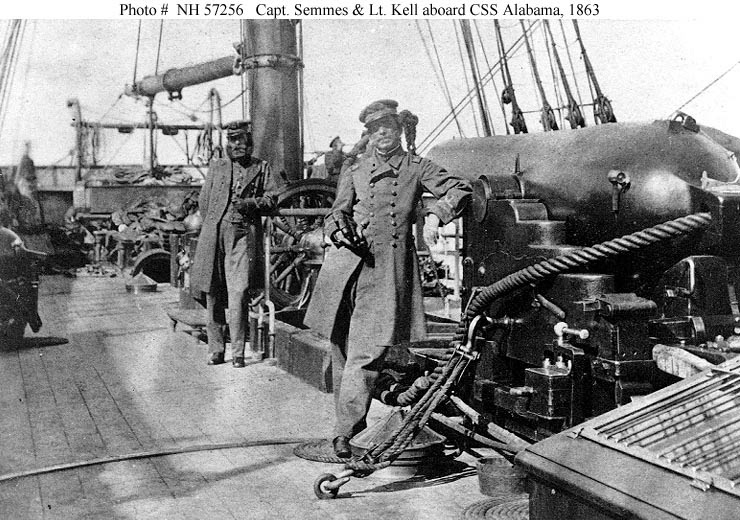 First Lieutenant John M. Kell, is in the background..
Captained by Ralph Semmes, the Alabama had a crew of 14 officers - mainly Americans - and 120 men, many of whom were Britons recruited in Liverpool when Captain Semmes stayed with Bulloch in Waterloo. The devastation wrought by the Alabama was finally brought to an end in June 1864, while she was being repaired at Cherbourg, France. After coming out to fight another vessel, the USS Kearsarge, which appeared off the coast, there was a spectacular battle and the Alabama was sunk. Semmes and some of the crew were rescued by an English yacht and so evaded capture. Interestingly, after the Civil War ended, Britain had to pay for the damage done to America’s shipping, with the compensation bill tallying, in today’s equivalent 6150 billion.